StreamSend has announced a new addition to their platform called Engagement Tiles, which they are billing as “the better way to banner”. 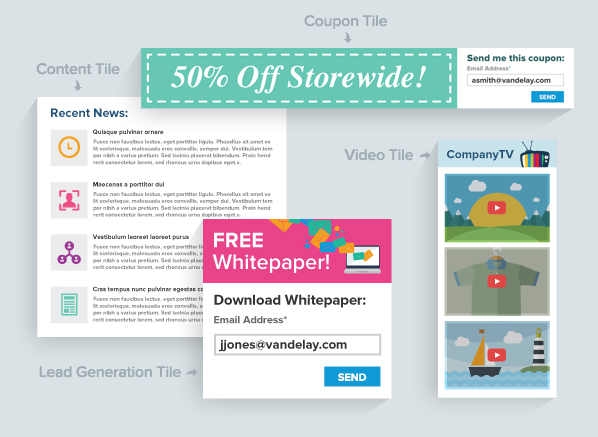 Engagement tiles are modular content blocks marketers can customize and place on websites and web pages. They allow a website to be more interactive and up-to-date compared to the banner ads of old: engaging rather than static, hence the name. Engagement tiles can also take the place of landing pages because customers can insert information into a field on the tile to subscribe, download something, or get access to what is being offered. Engagement tiles also offer access to items such as mobile coupons and content feeds. This access van be important since most people now open emails on mobile devices. More and more are on the web via their phones as well too. Mobile users prefer fewer clicks to get to the content they want. To use engagement tiles, marketers use the drag-and-drop dashboard, choose the tile size that best fits the space, add an image, and add a form (if necessary). Then users copy and paste the embed code provided by StreamSend into the desired website. Yes it is a way to create embedded content for your site or landingpages. StreamSend suggests thinking of engagement tiles as a way to start a conversation, meaning marketers should ask for less contact information initially and follow up with email later to start building the relationship with the prospect. A technique generally known as progressive profiling. This ties in well with mobile usage as people tend not to want to enter a lot of data when typing on the smaller screens of smart phones.